Postcard US-2070982 was sent to the Netherlands on February 2, 2013 and had since expired. It is about to fall off the PostCrossing Universe as it is approaching its life span of 365-day travel time. 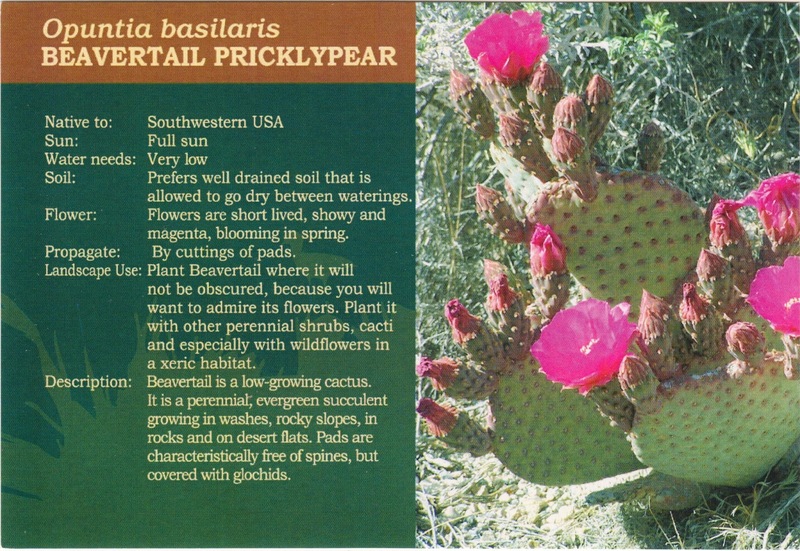 The postcards shows the Beavertail PricklyPear (opuntia basilaris), a cactus species mostly found in the Mojave Desert, Anza-Borrego Desert State Park, Colorado Deserts and Colorado Plateau, and northwest Mexico. A single plant can grow up to 60 cm tall and may consist of hundreds of fleshy, flattened pads that are measured up to 14 cm long, 10 cm wide 1.5 cm thick. Their flowers are mostly pink to rose in color, but also rarely white or even yellow, blooming from spring to early summer. The postcard was purchased at the gift shop of the Las Vegas Springs Preserve, which again offers free admission to the Bank of America or Merrill Lynch debit/credit card holders through the Museums on US program on February 1 and February 2, 2014.